A rare wall map of the United States by H. S. Tanner. Henry Schenck Tanner (1786 - May 18, 1858) was one of the preeminent American map engravers and publishers of the early 19th century - what is considered to be the "Golden Age of American Map Publishing". Born in New York City but based in Philadelphia, Tanner's forty plus year career was almost entirely focused on cartographic work. His earliest map work appears in conjunction with another important map publisher, John Melish. Early in his career, Tanner partnered with his brother Benjamin, to engrave extensively for Melish as well as other Philadelphia publishers including Lucas Fielding (Baltimore), A. Bourne, Jason Torey, Samuel Harrison, and Samuel Lewis, among others. 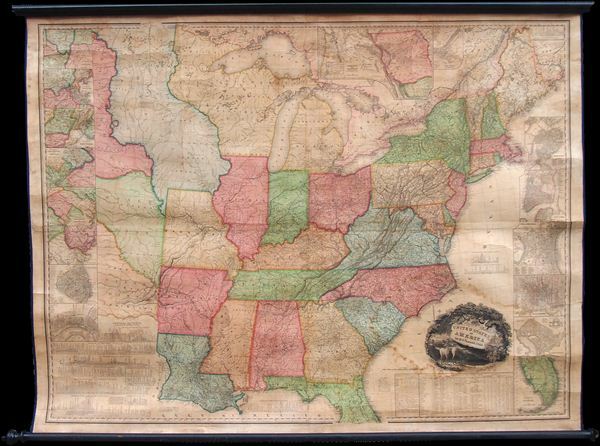 In 1818 Tanner convinced his fellow publishers and partners to finance the compilation of a New American Atlas. The atlas was sold by subscription and slowly emerged between 1819 and 1823. The New American Atlas, possibly the pinnacle of 19th century American cartography and was commended in its day as "one of the most splendid works of the kind ever executed in this country". It was subsequently republished in several updated editions until about 1839. Tanner had by this time become the most active and influential map publisher in the United States. Around 1832, recognizing the market for a less cost prohibitive atlas, Tanner began work on the smaller format New Universal Atlas. This popular and important atlas went through numerous editions before being bought out by Carey and Hart, and then, in 1846, by S. A. Mitchell, who would rise to become the preeminent publisher of the next generation. In addition to these important atlases, Tanner also issued numerous extremely important and influential travelers guides, state maps, wall maps, and pocket maps. He should not be confused with his brother, also an America map engraver, the New Yorker Benjamin Tanner. Good condition. Professionally devarnished and mounted on fresh linen. Mild water stain near title cartouche.